Kendall and I got up this morning and got to enjoy a full on banquet breakfast. 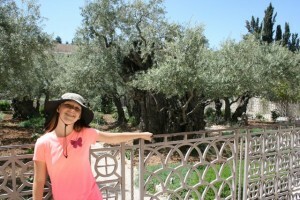 We have stayed at apartments mostly, so this was our first real hotel experience in Israel. I got a deal online, so we are in a business class hotel, and it is very nice. After breakfast we made our way to Herod’s Gate for our first real taste of Jerusalem’s Old City. I am not sure you can really taste the old city. The experience is much more like holding your nose at the top of a high dive for the first time and jumping in. 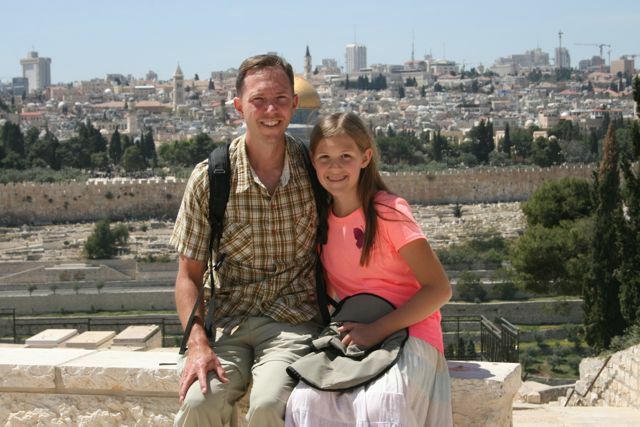 We went for it and took the Jerusalem plunge! Immediately we went down deep in the fray of catacomb streets and the city bustle. This city throbs with life as street merchants, cars, mopeds, and walking people all mash together in a 10-12 foot alleyway. You really do not even have to walk as the crowd will literally carry you along. 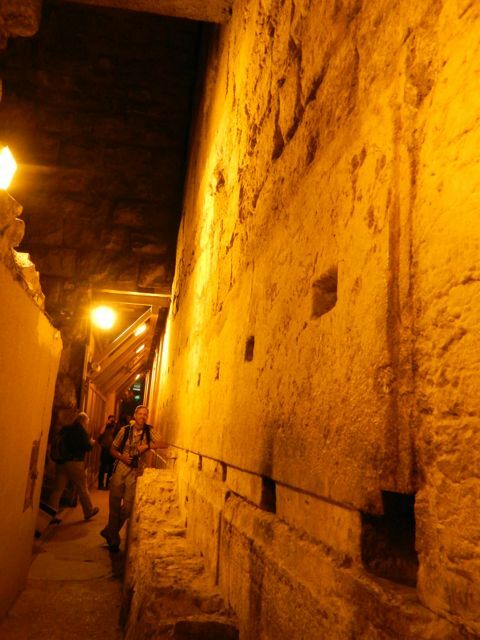 We were in the Muslim quarter and wove our way to the Damascus Gate and then straight through the old city to the western wall. Kendall’s senses were on overload en-route, and she tried to stick to me like glue. What an experience. At the western wall we went on the tunnel tour. 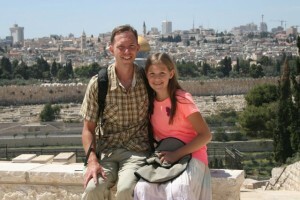 If in Jerusalem, you must do this tour, it is fantastic! I really learned so much about the history of this plot of land and how God is connected to it. You immediately get to touch the history you are learning about as the story of the stones come to life. During the tour we saw a truly gigantic stone, weighing the same as a fully loaded 747 (nicknamed the flying stone). I asked the question why it was put there, so high (30 meters) above the original ground level. The guide said they believe (no one knows for sure) that the stone and two others like it were used for compression on the arch support structures. King Herod was thinking ahead to prepare for geologic events like earthquakes, as an arch under pressure is much more secure. After the tour we went to the Garden of Gethsemane and up the Mount of Olives. The garden was very peaceful and since we dodged the tour groups we were basically the only ones there. Going back to the Dung Gate the police were gearing up to protect everyone for the beginning of the sabbath (starts sundown on Friday) at the western wall. I actually enjoy the fact that there is so much security. I also like every Israeli citizen doing two years of military service and then weekend reserve duty on an active basis. This means the whole country is educated and actively engaged in protecting their freedom from all who would like to do them harm. April 12th: The Western Wall, Garden of Gethsemane, and “crazy” Jerusalem! I woke up at 5:00 and daddy couldn’t sleep so he was typing, and he told me to try to go back to sleep. I couldn’t, however and so at about 6:00 or 5:45, I jumped in the shower. My hair, no matter how ratty it was before I went to bed can be brushed to be like silk. Then I take a shower, and it goes crazy and is so ratty I can’t brush it so daddy has to. Well, when we were ready, we tried to take our time because breakfast here at the hotel starts at 7:00 and we had an hour to wait even if we were hungry. We ran into the elevator and went up to breakfast on the fourth floor. We had an awesome meal. We got so full we couldn’t eat any more, but we hated to waste good food, so we finished what was on our plates. Then we went back to our room to find out we didn’t have any more hard disk space on our computer. 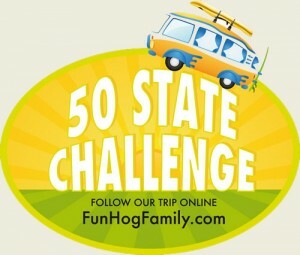 Between our 50 state challenge trip, family pictures, and this trip, we are officially out of space!!! So, daddy started deleting right and left. It made me so sad to see it all being deleted. 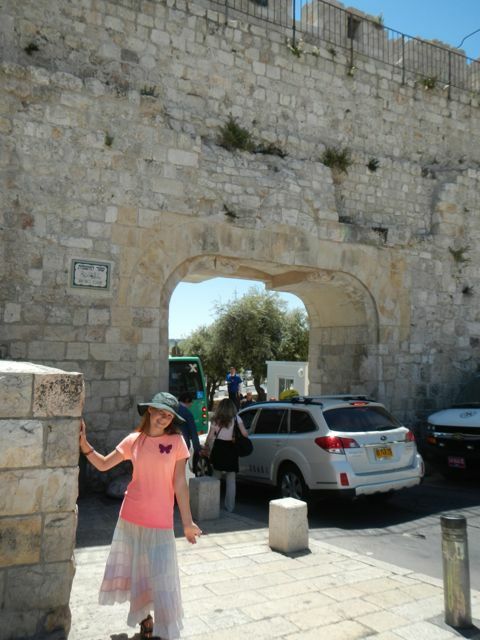 Next, we walked down to the old city (which was very close) and tried to find a way to get on top of the wall. We walked along the bottom part and could not find a place to ascend. 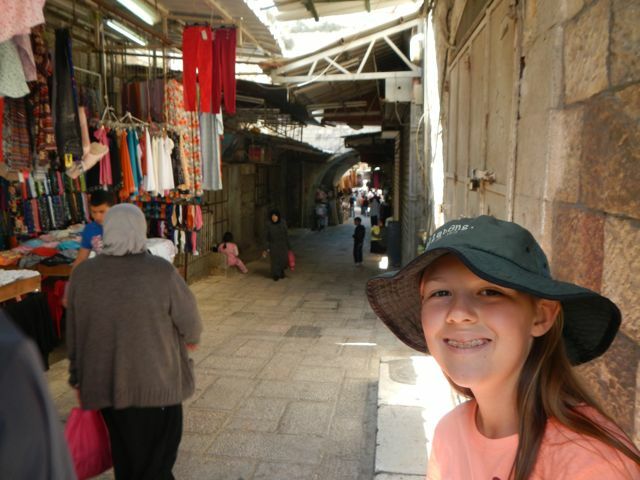 Jerusalem is not at all what I thought it was like. I thought it was solemn and holy, with priests everywhere singing holy songs, praying, fasting, humbling themselves before God, everyone quiet, modest and full of God. What it is like is noisy, crowded, busy, loud, thinking everyone only of himself, and it does not remind, or make me think of Jesus at all because it is the opposite of what he is. 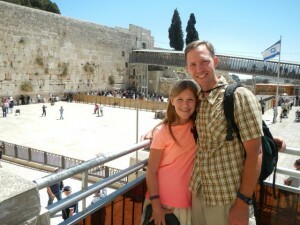 Then we came through a check point and found ourselves facing the western wall itself. It was really cool. Then we went and signed up for a tour of the western wall tunnel. It was so awesome and cool! I just loved it. The next tour was not fun at all (a multimedia tour called the chains of generations). It was ok, but not interesting (just pieces of glass and lots of talking). 2: If you are walking peacefully down the sidewalk in between four people with more behind, watch out and listen because daddy and I were doing just that when a motorcycle, having decided it had been too long in traffic, came beeping and zooming right into us! We hurried out of the way as fast as we could but after it banged through us, it banged into another group behind us without beeping its horn until touching them! And that is on the sidewalk where we can walk. The road is for cars, bikes, and buses. But cars ride on the sidewalks too, we just found out. It is so super crazy!!! You think they’ll wreck, get a speeding ticket, or get hurt, but they don’t. It is weird to me, but they must be used to it. Then we headed back to our hotel, where daddy had the choice of deleting all our funhog family trip or not take any more pictures after tomorrow. I can’t write anymore tonight; I’m sorry. But I need to pray. Good-night.